A blog with detailed information and high resolution photos of music released on vinyl records. This entry was posted in Heavy Metal, Speed / Thrash Metal, Thrash Metal, Vinyl Records and tagged Kreator on April 11, 2019 by vinylmeister. This album includes the original custom inner sleeve with album details, complete lyrics of all songs by Slayer and photos of the Slayer-band. This entry was posted in Heavy Metal, Speed / Thrash Metal, Thrash Metal, Vinyl Records and tagged Slayer on April 4, 2019 by vinylmeister. This section of the Vinyl Record Collectors guide lists the complete gramophone aka vinyl LP record discography of the Thrash Metal band SLAYER. On this summary page you will find album/record catalognrs, album titles, year of issue and country in which the record was issued. Dave Lombardo (Full-name: David Vincent Lombardo) is a drummer and together with Jeff Hanneman and Kerry King founding member of the American Thrash Metal band “Slayer”. He played with Slayer during the periods 1982-1986,1987-1992,2001-2013. Dave Lombardo has performed with “Mike Patton” from “Faith No More” in a couple of bands, these bands are: “Dead Cross”, “Fantômas”. Bands in which Lombardo has performed include: Dead Cross, Escape, Fantômas, Grip Inc., Melvins, Pap Smear, Philm, Sabotage, Slayer, Suicidal Tendencies, Testament, Voodoocult. Kerry King (real-name: Kerry Ray King) born in Los Angeles, California, June 1963, Guitarist and co-founder of the American Thrash Metal band Slayer. He has been performing with Slayer since 1981. During 1984 Kerry King performed as a substitute guitarist with the American Speed/Thrash Metal band “Megadeth”. Jeff Hanneman (real-name: Jeffrey John Hanneman) was born in Oakland, California in January 1964 and founding member of the American Thrash Metal band: Slayer. He performs with Slayer from 1981 until his death in 2013 due to health issues. Tom Araya, (real-name: Tomás Enrique Araya Díaz), lead vocals, bass guitar player was born in Viña del Mar (1961) and founding member of the American Thrash Metal band “Slayer”. Tom Araya has active in Slayer since it’s formatin in 1981. Before forming Slayer, Tom Araya was in a band called “Tradewinds”. Detailed information incl collector’s information, production information, and photos of the album covers can be viewed by selecting the records below individually. This entry was posted in Heavy Metal, Speed / Thrash Metal, Vinyl Records and tagged Dave Lombardo, Jeff Hanneman, Kerry King, Slayer, Tom Araya on February 15, 2019 by vinylmeister. Asgard is a Dutch Power/Thrash metal which was originally named “Angel Dust”. This is the only one official album: “In the ancient days”. Around 1985 “Angel Dust” was disbanded and Appie van der Lei , Catrinus Homan, Harry Gravers, Peter Visscher and Rene Tholen continued as the ASGARD band. Ingo Nowotny is a German producer and former musician from Usingen. He founded at least four rock (later Nazi/RAC) labels and/or publishing companies: Metal Enterprises, Nowotny Music Enterprises, Nowotny’s Noize and IN Career Development. Ingo Nowotny is from Usingen in Germany and is known for the production of several Heavy Metal albums in the late 1980s. Bands for which he produced albums include: Asgard, Beast, Black Virgin, Blowin Free, Bohse Onkelz, Break Point, Burning Vision, Escape, Expect No Mercy, Extreme Napalm, Godzilla, Kahlkopf, Reaper, Think of Misery. Ken W. Kelly is a fantasy artist. Over his 30-year career, he has focused in particular on paintings in the sword and sorcery and heroic fantasy subgenres. In the 1980s he did the album covers for Manowar, Asgard and Rainbow. This entry was posted in Heavy Metal, Speed / Thrash Metal, Vinyl Records and tagged Asgard, LP, Netherlands, Noise International, Vinyl on February 15, 2019 by vinylmeister. This is a concept map showing the evolution of the German Thrash Metal band. Click here to access this interactive map. (Please be patient as it may take a few moments to download it. This entry was posted in Speed / Thrash Metal and tagged Concept Map, Destruction on February 14, 2019 by vinylmeister. 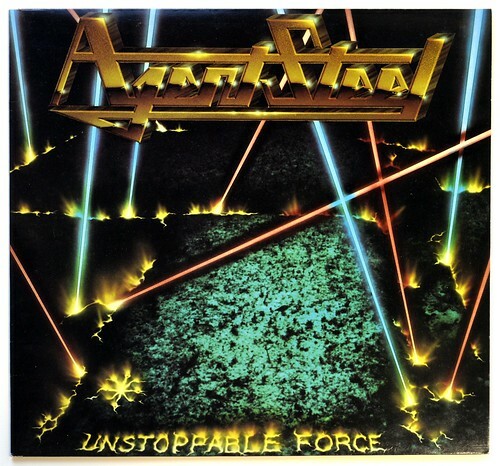 “Unstoppable Force” is the second and final album by the Speed Metal band: “Agent Steel”, after the recording of this album the band split up. If you like “King Diamond’s” high-pitched singing style, you will definitely like “John Cyriis’s” singing on this album. Mike Fuller is founder of the Fullersound Inc , sound studio in Fort Lauderdale, Miami. Mike Fuller has been responsible for the mastering of many heavy metal albums. Bernie Versailles (real name: Bernie Versye )has played in Metal bands including: Agent Steel, Engine, Masters of Metal, Redemption. The real name of Chuck Profus is Charles Profus. Chuck Profus started his career playing drums with Agent Steel and worked with Agent Steel from 1984 till 1988. After leaving Agent Steel he played in bands like Pontius Prophet, Black Reign, Sanctuary, The MOFO Homeboys. In the bands “Pontius Prophet” and “Black Reign” he continued to perform with his mate from “Agent Steel” John Cyriis. Dan Johnson- Producer and sound engineer has succesfully produced and engineered heavy metal music during the 1980s. Some of the band he has worked with include Coroner, Crimson Glory, Death, Mad Max, Savatage. John Cyriis is together with Chuck Profus the founding members of the “Agent Steel” band. John Cyriis name is mispelled as John Cyriss on the Agent Steel album Unstoppable Force. In the bands: “Black Reign” and “Lemegeton” , “John Cyriis” was using the pseudo: “Max Kobol”. John Cyriis used the pseudo “Father Damien” while singing in the “Pontius Prophet” band. In the bands “Pontius Prophet” and “Black Reign” he continued to perform with his mate from “Agent Steel” Chuck Profus. Juan Garcia, has played guitars in several Heavy Metal bands, including: Abattoir, Agent Steel, Evildead and others. “Morrisound Recording” is a music recording facility located in Temple Terrace, Florida , owned and operated by the three brothers Laurel, Tim and Jim Morris. The facility has been used for recording dozens of heavy metal albums, in particular albums for “Agent Steel” , “Cannibal Corpse”, “Death”, “Kreator”, “Nasty Savage” and “Sepultura”. Randy Burns is an American Music producer, Sound Engineer, and sound mixer. Responsible for the recorded sound of many Heavy Metal bands during the 1980s. Bands he has worked with include: 3rd Stage Alert, Agent Steel, Aversion, Bitter End, Chris Poland, Crumbsuckers, Dark Age, Dark Angel, DBC, Dead End, Death, Excel, Helstar, Kreator, Leatherwolf, Lizzy Borden, Ludichrist, Megadeth, Morgoth, Mortal Sin, Nuclear Assault, Possessed, Suicidal Tendencies, Uncle Sam, Zoetrope. Scott Burns, – has been producer, sound engineer, mixing enginer of many Heavy Metal bands from 1987 till 2012. Nasty Ronnie (from the Heavy Metal band: “Nasty Savage” is background vocals on the the tracks “Indestructive” and “Rager”. This entry was posted in Heavy Metal, Speed / Thrash Metal, Vinyl Records and tagged Agent Steel, Bernie Versailles, Chuck Profus, Dan Johnson, John Cyriis, Juan Garcia, Mike Fuller, Mike Zaputil, Morrisound, Music For Nations, Nasty Savage, Randy Burns, Scott Burns, Tom Morris, Unstoppable Force on February 13, 2019 by vinylmeister. Is an Extented Play (EP) record originally released in 1986 on the record labels “Music For Nations 12 KUT 124” and “Combat MX-8080” and released in Germany during 2016. 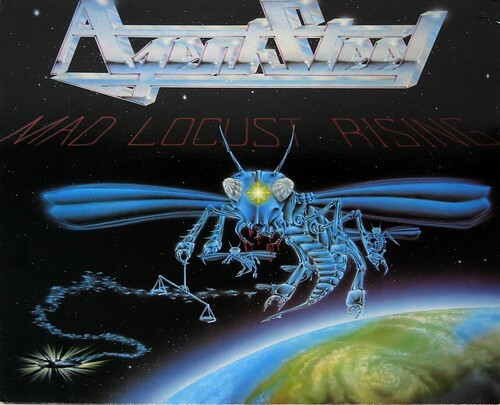 This entry was posted in Heavy Metal, Speed / Thrash Metal, Vinyl Records and tagged Agent Steel, Mad Locust Rising, Steve Sinclair on February 13, 2019 by vinylmeister.